Sometimes you may want students to submit a revised version of an assignment. To do this, they just need to upload the file again. Once a file is added to Kaizena, any changes to the original file (in Google Docs or on a computer) won't show up in Kaizena. If you want to see an updated version of the file, it needs to be uploaded again - exactly the same way it was uploaded the first time! 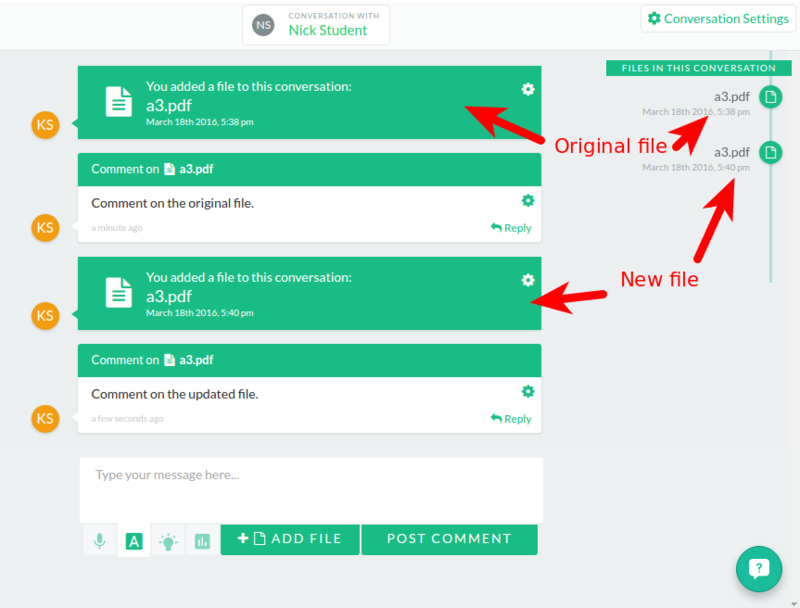 Feedback attached to the original file won't be attached to the new file. The old file and feedback will still be visible in the conversation. See the screenshot below to see an example of a file added to a conversation twice. The original file and comment are at the top, followed by the revised file and new comment. Note that each file has the date and time it was added (in the red boxes). Need help adding a file? Click here.